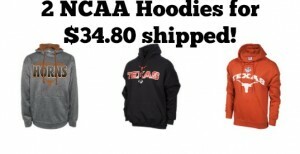 NCAA Hoodies Sale: 2 for $34.80 shipped! If you’ve got a college sports fan, get 2 NCAA Hoodies for just $34.80 shipped! These make great gifts for high school and college students! They’ve got 65 pages of stuff that’s included in this sale, so I’m sure you’ll find your favorite team. They’ve got men’s and women’s sizes, too! Enter the code NCAADEAL at check-out for additional savings! You’ll pay just $34.80 (not including taxes) and get FREE SHIPPING, too! These are a reader favorite every year. Just a word of advice – readers have reported that they run small, so plan accordingly! College Hoodies 2 for $35 SHIPPED! Here’s a GREAT gift idea for college students! 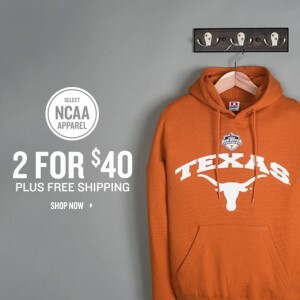 Get 2 College hoodies for $35 shipped! They’ve got lots of different teams to choose from and styles for men and women! This includes the fleece pants, too! You can mix and match!! 2. Choose at least two hoodies to add to your cart! NOTE: Readers who ordered this deal last year commented that the sizing tends to run small, so you may want to plan accordingly. College Hoodies 2 for $40! As your kids are getting ready to head off to college, this popular Finish Line promotion is BACK! 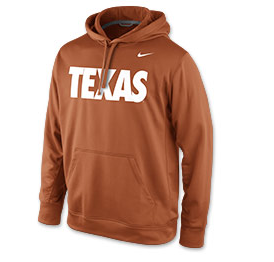 Get 2 college hoodies or sweat pants for just $40! You can mix and match teams! Click here to check it out–> College Hoodies 2 for $40! There are a number of teams to choose from. You WILL need to add two items to your cart to see the discounted rates. NOTE: When they have had this sale previously, readers have reported that these run small, so you may want to order a size up. This post contains affiliate links and I will be compensated if you make a purchase using these links. It’s March Madness and to celebrate, you can score NCAA hoodies for just $9.99 each! They’ve got sizes for men, women, and kids and lots of teams to choose from! You can also save 50% on Under Armour Apparel. You can save $10 off orders of $75 or more with coupon code 10SNOW75. Finish Line Hoodies 2 for $35! The Finish Line sale on hoodies is even BETTER now! You can get 2 for $35! They’ve got lots of different teams to choose from and styles for men and women! 2. Choose at least two hoodies or sweats to add to your cart! If you purchase 4 items, enter the code 10HLDY75 at check out to save $10 and get free shipping! Get 4 items for $60 shipped! That’s just $15 each!